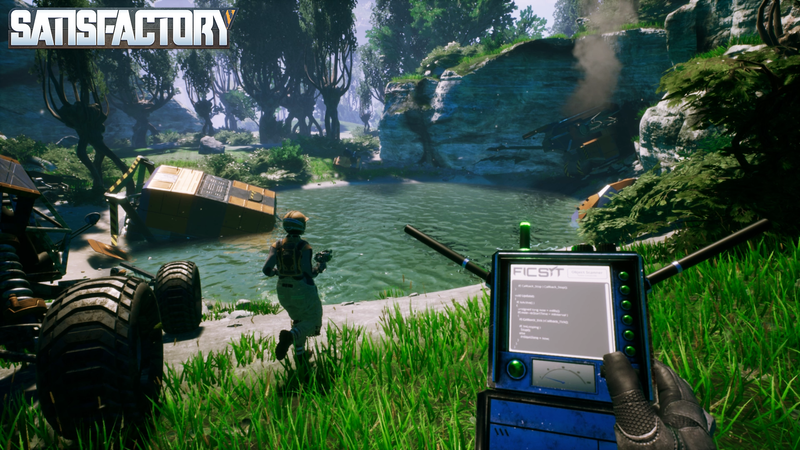 Satisfactory is an ambitious open-world factory-building simulator from Coffee Stain Studios, the Swedish developer that created viral sensation Goat Simulator. 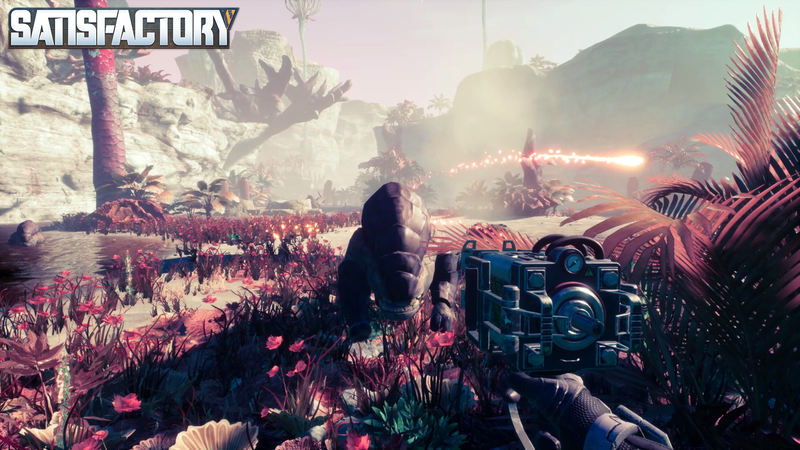 While Goat Simulator offered a humorous sandbox experience, Satisfactory aims to develop a much more ambitious experience that combines elements of shooting, crafting, and vehicles in a setting where you play as an engineer on an alien planet and are tasked with constructing a massive machine for some mysterious reason. The game is hitting Early Access on the Epic Games Store on March 19. We recently had the chance to interview Coffee Stain Studio Programmer and Community Manager Jace Varlet, and in this post, he discusses how they’re designing the game to be therapeutic, elaborates on the combat, talks about how they achieved the game’s visuals, and more. Thanks for taking the time to answer our questions. 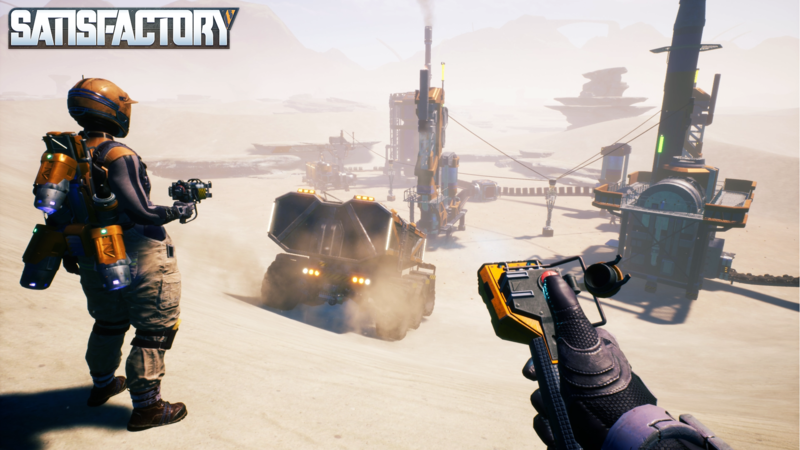 Considering Satisfactory combines first-person shooting, crafting/factory building, and vehicles, it's shaping up to be a very unique game. How did you come up with the concept for Satisfactory? Coffee Stain Studio Programmer and Community Manager Jace Varlet: The original concept arose during a prototyping period we had after we decided to stop working on Goat Simulator. We started voting on what we did and didn’t like. A couple of us (who were obsessed with Factorio at the time) created a 3D first-person factory-building sim, and everyone in the studio was hooked. It was an easy decision from there and Satisfactory was born. The game looks a bit calming to play. Is it intended to be somewhat therapeutic? Varlet: It is. The calming atmosphere serves two purposes. The first is to not frustrate or distract you as you think and refactor your factory. The second is to create a contrast between the peaceful nature of this untouched planet and the effect human interaction has on it. When inside your factory, the sound of machines around you can drown out the peaceful ambience. Our early teaser trailer with Lizard Doggo also highlights this. Not much has been revealed regarding the gunplay. What will players be shooting at in the game? Varlet: There are many kinds of aggressive wildlife out in the world that you will need to defend yourself against. From “Hogs” to “Spitters” to spider-like creatures, and more. Oh, BTW, if you’re arachnophobic, there is an Arachnophobia Mode, which turns the spiders into giant cat sprites. There are also passive creatures. You can shoot them. If you’re a monster, that is. How big of a component will combat be in Satisfactory? Varlet: Exploration is a pillar of Satisfactory and we’ve done a lot to make it engaging and rewarding. Combat helps achieve that. Combat is not as fleshed out as a First-Person shooter, but it is fun, difficult, and makes exploration a little scary. 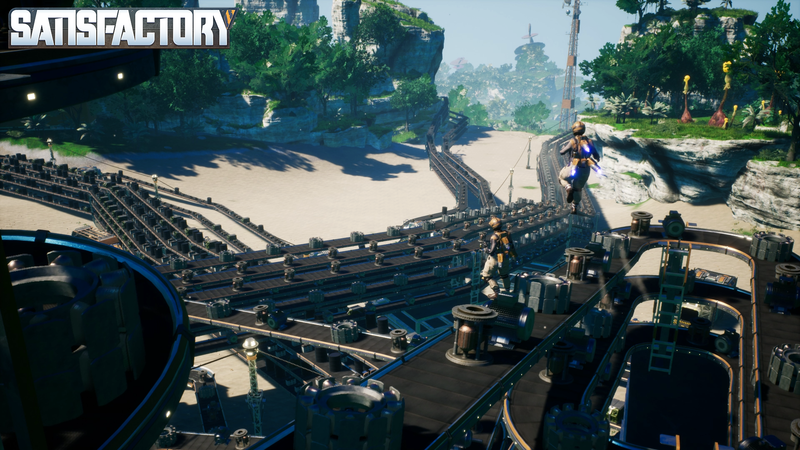 Satisfactory allows players to program a vehicle to continuously drive around a custom-made route. What is the purpose behind this and was it difficult to implement? Varlet: The main purpose is to deliver resources long distances while the player can continue doing other things. For example, coal may be located very far away from your factory, so you need to get it back somehow so that you can process it. Of course, you could just build a really long conveyor belt! However, building one tractor and recording its path is far cheaper than building a gigantic conveyor belt to a resource gathering outpost. Also, it’s fun. The game’s visuals are fantastic. How did Coffee Stain Studios come up with and execute on the aesthetic? Varlet: As human beings, we have some sort of expectation of what a tree looks like, or a rock, or a plant, right? Technically, an alien planet does not have to meet those expectations, but in a game, it’s better if we do. We want our players to understand what they are looking at, but not feel like they are at home. Familiar, but alien. The view distances in the game seem quite vast. Which UE4 tools are you using to help optimize performance? Varlet: Yeah! We’ve done a lot of things to improve the view distances. We’ve taken advantage of Level LODs tool so that we can see the entire map at any time. [We used] hierarchical LODs to reduce draw calls on large clumps of level objects (e.g. cliff faces), also culling volumes and foliage LODs. Also on certain objects, we sometimes swap out its materials to simpler versions when they are far away. Considering constructions can get quite complex, how are you ensuring that the game is accessible to more casual players? Varlet: We have worked a lot with the onboarding process of the game. Starting simple and growing more complex one step at a time is the way to go. Just don’t throw them in the deep end! Also including the exploration aspect, I think, helps. If players need a break from designing their factory (like I sometimes do), they can just go wander around and see what they can find. Was it difficult to come up with the logic for how structures and conveyor belts would connect and interact with each other? Varlet: Actually, this was solved during the prototyping phase of the game. However, the solution at the time was rough and needed a rewrite. G2, one of the programmers that worked on that system, says the math was probably the hardest part. While spline math is nothing to write home about, getting things to work in a way that is expected of a conveyor belt was quite challenging. Coffee Stain Studios has previously teased multiplayer. How many players is Satisfactory aiming to support and can you elaborate on how multiplayer will work? Varlet: There will be multiplayer! We officially support one to four players, but we will not set a hard limit. Go nuts! Play with 50 people and tank your PC if you want. Just please don’t file it as a bug report. Instead, put it on YouTube for the views. Varlet: We’ve worked with Unreal Engine since before we were Coffee Stain. So familiarity helps a lot. But it’s also just really nice to use. The ability to customize the engine completely is great. In my opinion, Blueprints is fantastic as it is intuitive for our artists to do a lot of scripting themselves, which means faster turnaround on their work and less load on programmers. What has been the biggest challenge for the studio and how did you overcome it? Varlet: The entire game, I guess. We have not done anything this big before. It was scary to make. During development, when the game hadn’t come together yet was a very trying time. Can we finish it? Will people like/buy it? It’s not really even fun right now. There were doubts. That’s kinda hard to deal with. But with blood, sweat, tears, and coffee, things have come together. It’s a game we are confident in and I think it shows. Is there anything you would like people to know about the game? 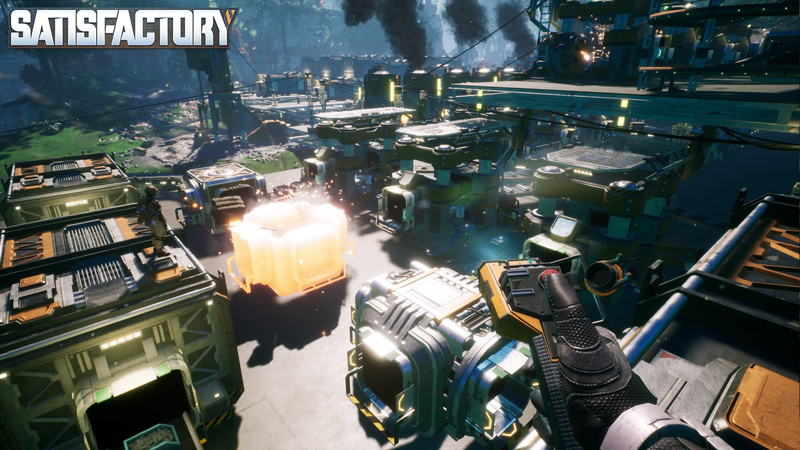 Varlet: While the factory game is the main focus of Satisfactory, I really hope people see beyond it, too. We have a beautiful hand-crafted world to explore and a lot of room for creativity. For example, some people made a minigame called SugarSumo: an arena high up in the sky where players try and push each other out of the arena using the Sugar Cube (tractor). Also, there is a jump pad “roller coaster” that flings the player around the map using jump pads. Thanks again for your time. 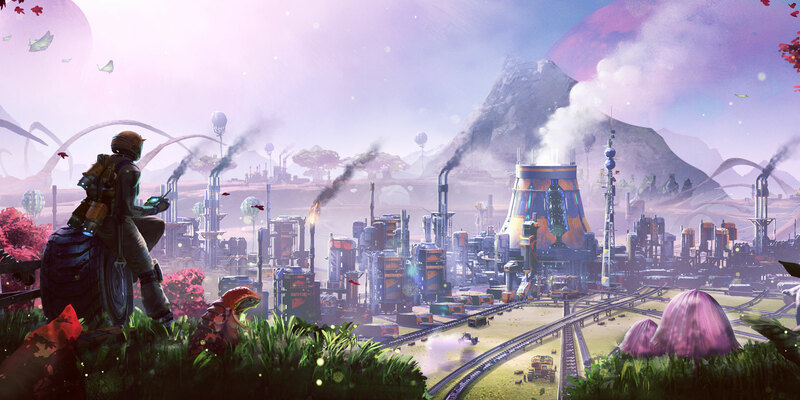 Where can people learn more about Satisfactory? Varlet: People can learn more at www.satisfactorygame.com and visit us on our social medical channels including Twitter, Facebook, Instagram, Discord, and Reddit.